Get your kicks and groove with us! 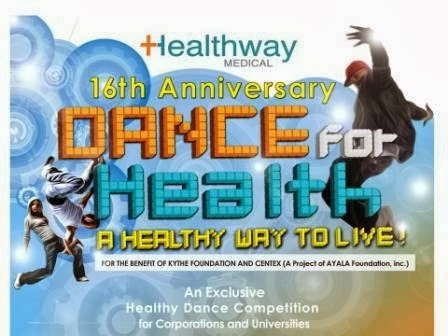 The Philippines’ premiere ambulatory service provider Healthway Medical is all set for their 16th Anniversary celebration as they bring you an exclusive healthy dance battle, “DANCE FOR HEALTH, a healthy way to live”. The elimination rounds will kick off on September 26, 2013 at SMX Convention Center and October 26, 2013 at Alabang Town Center. The grand finals will be on November 23, 2013 at Glorietta Activity Center. The contest is open for university students, 17-21 years old who have the grooves to showcase their talents in dancing or have their own dance group or crew. Students who are fancy of joining extra activities to hone their ability and at the same time strive for a good physical routine. While for the corporate, it should be 22-35 years old who have the passion in dancing and aiming for a healthy lifestyle. Employees who love to join aerobics, zumba, pole dancing, and other form of dance classes can show off their hip and style on the dance floor. As Healthway Medical is known for their prevention rather than cure mantra, they come up with an exciting dance competition to celebrate their anniversary in a healthier way. “Dancing is a form of art but it is also considered as a great form of exercise. It is one of the most effective cardio exercises, not only for weight loss purposes but also for maintaining a healthier way of living as it involves different body movements. It conditions the human body, reduces the risk of osteoporosis, and improves blood circulation and cardiovascular disease. That is why I foster dancing in our company” said Carmie de Leon, Healthway Medical, VP for sales and marketing. And as part of their anniversary program, Healthway Medical invites all corporate and universities to showcase their moves on the dance arena. Aside from cash and wellness packages, the dance contest also serves as an advocacy campaign wherein it benefits the KYTHE Foundation and CENTEX, a project of Ayala Foundation, Inc.
KYTHE Foundation is a non-profit, non-stock organization aimed to inspire hope for the hospitalized children with cancer and chronic illness. As KYTHE (means “to make visible”) is already 20 years in service, they continue to help these children in achieving quality life through their KYTHE Childe Life Program. They are the only foundation in the country that offers such service through the help of group of trained professionals. Memorandum Agreement between the Department of Education and Ayala Foundation which caters bright children from economically disadvantaged families who needs quality education and ample support for their brighter future. CENTEX operates two public schools in Tondo Manila and Bauan Batangas wherein they served as a learning environment for the children to secure a better opportunity ahead. With this, Helathway Medical pushes this exciting dance competition not just only to celebrate but also in lending some kindness to those blessed children. So, let’s dance for happiness. Let’s dance for a cause. Let’s dance for a healthier life with HEALTHWAY MEDICAL!